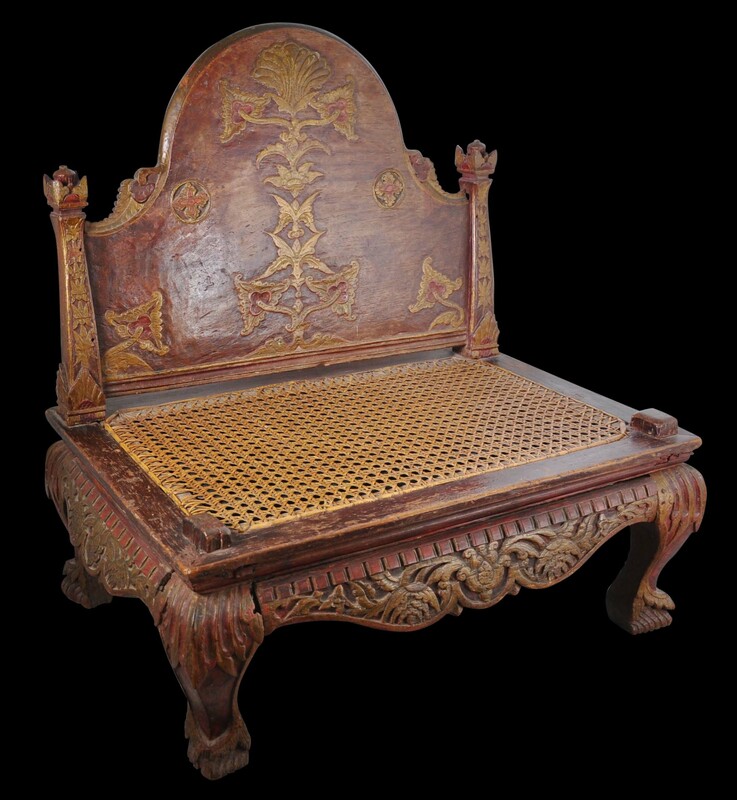 This small wooden chair with the original rattan seat was used on Java as part of the circumcision ceremony for a young Muslim boy. The just-circumcised boy would have sat on it in ‘state’, as if a prince for the day. The low nature of the chair was suitable for a young boy, and the wide seat would have allowed him to sit more comfortably with legs apart, so that his sarong did not settle on his wound. The backrest of the chair is carved in low relief with what is either a stylised tree-of-life motif, or a stylised caduceus, the symbolic staff of the Roman god Mercury who was adopted as an emblem by the Dutch East Indies Company (VOC). 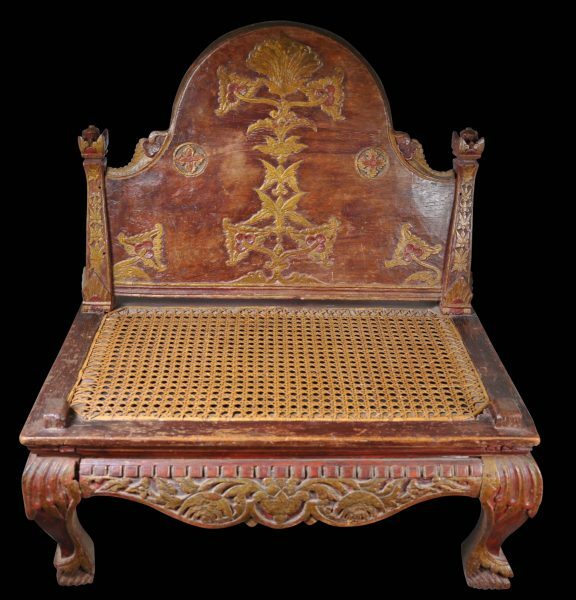 Elsewhere, the chair has been carved with rococo flourishes in relief, and it sits on four cabriole legs. Probably it dates to the 19th century but some elements suggest it might be earlier, perhaps 18th century. 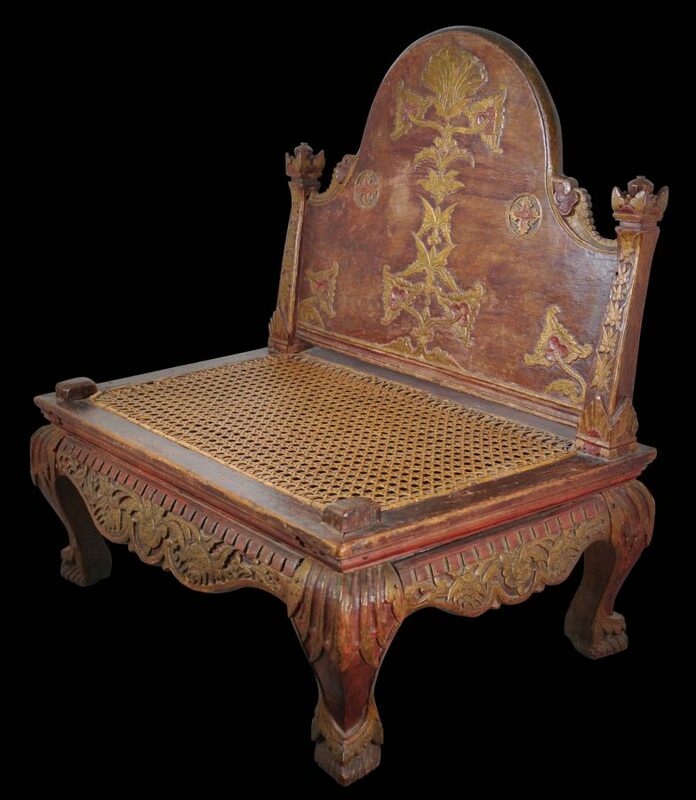 The chair has been carved from local teak, most probably, and has been coloured with red and brown pigments and with traces of gilding. It is in original condition. The joints are loose from use and minor shrinkage but there are no amendments or losses. A similar chair is illustrated in Brinkgreve & Stuart-Fox (2013, p. 160-61).